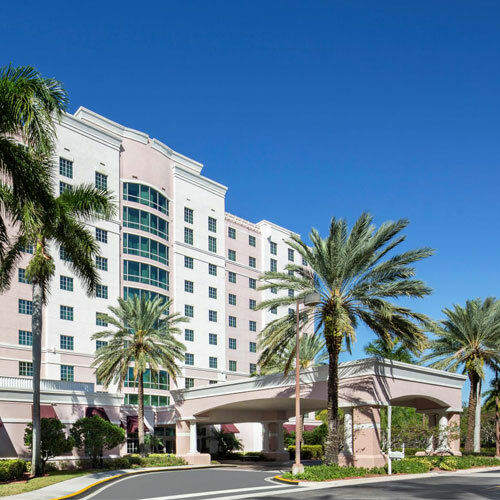 Just across from the Sawgrass Mills Mall and down the street from the BB&T Center (NHL's Florida Panthers hockey arena), this hotel offers attractively appointed guest rooms. Popular with business professionals, this hotel boasts more than 7,000 square feet of banquet space and a staff that often references the property as 'the place to meet.' An open business center and the full-service restaurant, Peyton's Place, are situated just off of the lobby. Journey out to the pool for some peace and quiet. The pool is attractively enhanced with brick pavers and colorful foliage. If a workout is part of the daily agenda then burn some calories at the fitness center, which features everything from cardiovascular equipment to machine weights. When it's time to retire to the room at the end of the night you will find an attractive décor ensemble complete with dark wood furnishings, granite counters and a comfty bedding package! Smoke free premises. 252 units. 10 stories, interior corridors. Accessibility (Call). Sawgrass Expwy (SR 869) exit 1 (Sunrise Blvd), 1 mi e. Across from Sawgrass Mills Mall. 13400 W Sunrise Blvd 33323.